It is no secret that mobile and online banking is pushing banks to rethink and modernize their marketing and advertising models. Despite popular belief, however, the branch is still an important element in the banking cycle. Nearly four out of five customers (78 percent) say that they expect to be visiting their local bank branch just as frequently—or even more frequently—five years from now, in large part because 66 percent of them still prefer to “talk to a person” rather than purchase a banking product online. Two-thirds say they consider branch closures more than a minor inconvenience, and nearly half would switch banks as a result. Branches also remain banks’ primary engine for sales. Nearly 60 percent of traditional retail bank products were sold via the branch, according to a recent survey. Right now, in short, the branch remains the pre-eminent channel and demands attention from savvy marketers. Marketers that realize the importance of modernizing the branch are using digital signage to create an integrated experience online, across mobile channels, and in bank branches, where engagement with customers is still significant. These cutting-edge banks are transforming the branch from a transactional hub where customers engage with tellers, to a dynamic source of information on financial products, services, and information – through the use of digital displays. The result – tellers empowered to “sell” banking services to clients, re-invigorating the potential of branches and modernizing the retail banking experience. Thanks to changes in technology, customer expectations of the experience they should receive when they visit the branch are rising all the time. A recent Accenture study showed that when presented with the following: “I expect industry-leading technological capabilities from my financial institution and advisors” – 72% of Millenials, 75% of Gen Xers and 69% of Boomers agreed or strongly agreed with this statement. Banks often measure their performance with customers based on service satisfaction, but service is only part of the equation. Transparency in fees and simpler contracts, and access to quality, impartial advice all sum up to a new value exchange between banks and customers that may define the next phase of banking. The customer should be at the center of the branch operation. The branch of the future is an engaging, interactive and fun environment. Digital signage provides a level of flexibility and efficiency for bank branches that print advertising never could. In a recent survey to more than 2,500 digital marketing executives, ExactTarget inquired about budgets, priorities, channels, metrics and strategies for 2014. The survey found that the two top priorities in 2014 are driving increased conversion rates (47%) and increasing and improving brand awareness (46%). Physically a bank can only have so many posters, flyers, buck slips, brochures and banners at any given time. And each static message is beholden to one general message that hopefully appeals to the largest market. Digital signage is not confined to these parameters. There can be multiple messages for each product or services that are geared to a particular age or income demographic. For instance, a newlywed couple may be interested in information about first time house buying and RRSP contributions, whereas a retired person would be less likely interested in either of these items. Each one would prefer to engage with information relevant to their circumstance. The era of physical scale is over, and banks can no longer win through size and operational footprint alone. Instead, leaders will win by finding innovative ways to improve the customer experience and adapting to market changes. To avoid being marginalized, traditional banks must embrace continuous innovation to give themselves a sustainable advantage within the marketplace. Multiple customer databases exist within a banking organization that creates a complete picture about who is in the branch, what they do when they are there, when they visit, how they handle their financial affairs and what is applicable to them from a products and service stand-point. This ability to have limitless messages relevant to each demographic has infinite appeal. The icing on the cake is the message and brand retention. 46% of people recall a message on a digital display over the 4% that recall what’s on a static sign. 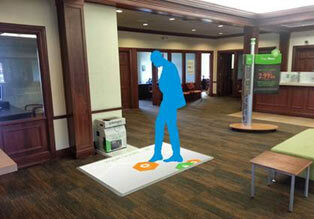 Capturing customers’ attention inside or outside the branch is easier with memorable touch points. Distinctive interactive walls, compelling messaging and outstanding presentations all contribute to a better customer experience. Cool toys, personalized advice and cross-channel integration are all essential tools for capturing the customer’s attention. But they all have to work together and be targeted at customers who are likely to respond to them. Touch screen technology creates an intuitive and interactive way for customers to explore financial options with an advisor, on their own or with their partner and is changing the way people collaborate and connect. Imagine a touch screen as a table, on the wall, or embedded in other fixtures or furniture so visitors to the branch can engage and learn wherever is most comfortable for them. But touch-screen technology is more than just an eye-catcher. It can be a complete distribution channel in its own right, allowing customers another opportunity for self-service banking. This is the branch of the future. While customers stand in teller lines, wait for a financial advisor or just wander through the branch, interactive walls can provide engaging interactions and compelling messaging for the financial shopper. They can browse for a car loan or a mortgage. By touching it they can get the latest rates, find financing options and do research before making a financial decision. To make the most of digital signage, robust analytics should be embedded in all processes throughout the organization, continuously leveraging analytics engines/algorithms to gain the deep customer knowledge that will enable them to personalize their advice. Digital displays are helping to increase recognition, engagement, and origination of new business opportunities, service quality and innovation.